Early 2017 saw the Government of Sri Lanka implementing the long awaited Right to Information Act, which is intended to curb corruption and provide access to information to the public. Later in the year, the new Inland Revenue Act was passed in parliament and is to take effect on1 April 2018. Both legal provisions received a largely warm reception as representing improvements to the legislative framework with the aim of moving Sri Lanka towards being a more equitable nation. But despite the cautious optimism when it comes to such measures, doubts are being cast over the framework of governance and business climate in the country. For instance, Transparency International’s Corruption Perceptions Index (CPI) places Sri Lanka in 95th place (down from No. 83 in the previous year) from among 176 nations with a score of 36 out of 100 (on a scale of 0 – or ‘highly corrupt’ – to 100 – i.e. ‘very clean’). The CPI aggregates data from many different sources that provide perceptions among businesspeople and country experts on the level of corruption in the public sector. It moots a three year economic delivery programme for which the state plans to implement a comprehensive economic strategy encompassing an increase in per capita income to US$ 5,000 a year, create one million new jobs, increase foreign direct investments to five billion dollars a year and double annual exports to 20 billion dollars. So how did Sri Lanka’s leading listed entities perform in financial year 2016/17 in the midst of the goings on? 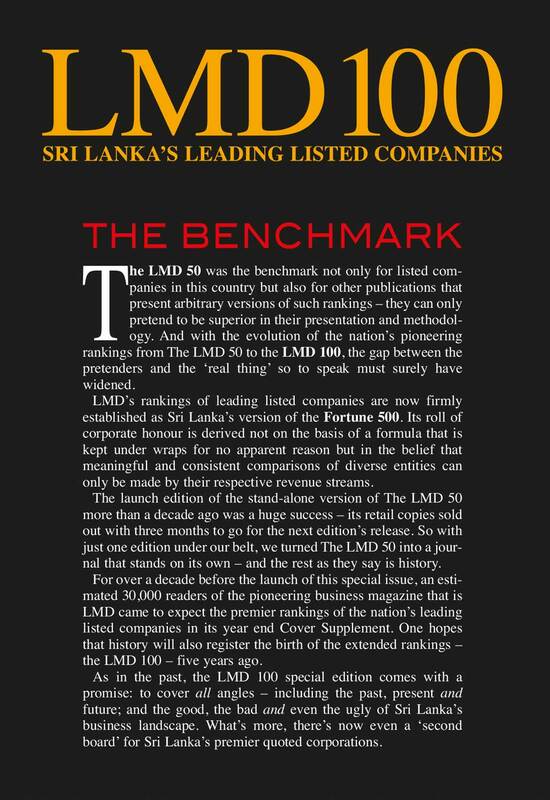 The LMD 100 rankings provide an all-encompassing reference point to the world of business here in Sri Lanka. And the latest edition of the LMD 100 sees Hayleys taking the top spot by a whisker ahead of last year’s title-holder John Keells Holdings (JKH) – Hayleys’ turnover (Rs. 111.4 billion) is only five percent more than that of JKH. Meanwhile, JKH also concedes the No. 1 spot for profitability to the LMD 100’s fifth placed Lanka ORIX Leasing Company (LOLC), which recorded a post-tax profit of almost 21 billion rupees in 2016/17 – albeit that roughly half of this upside was derived from acquisitions and divestments of group investments. In terms of market capitalisation, which is another prime indicator of corporate might, JKH led the way with a market cap of more than 190 billion rupees at 31 March 2017. Thirty-two of the top 100 listed corporations reported lower earnings in financial year 2016/17 compared to the preceding 12 month term. Moreover, the latest rankings reveal that there were 10 loss makers among the 100 leaders (2015/16 – 12) although 56 companies (compared to 60 in 2015/16) reported profit upside in the double digits or higher. In the latest edition of the LMD 100, a whopping 71 companies (versus 61 in the prior year) recorded an annual turnover in excess of 10 billion rupees so it may not be long before the listing makes its mark as the ‘Rs. 10 billion club.’ As for bottom lines, nine entities enjoyed post-tax profits of over five billion rupees. 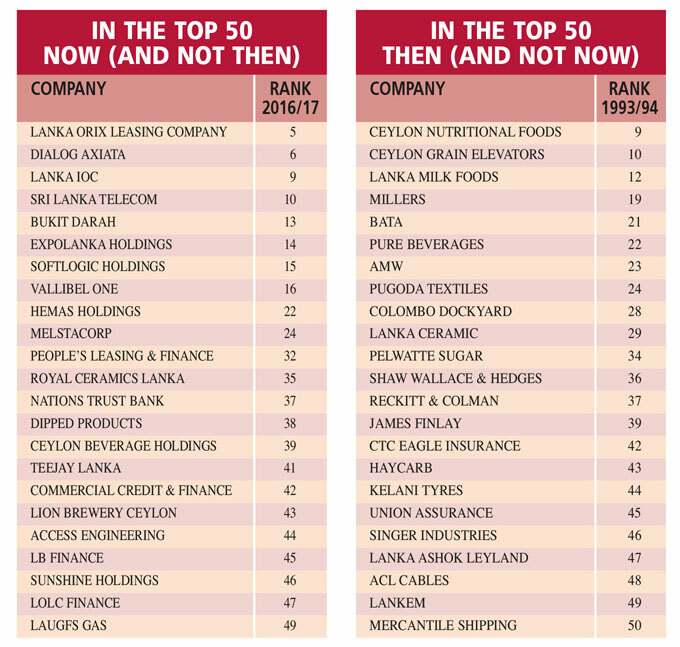 Turning the clock back to past editions when the pioneering rankings were first published in 1993/94 (that was when the LMD 100’s predecessor – The LMD 50 – was compiled for the first time), Sri Lanka’s corporate heavyweights consisted of 23 entities that do not feature in the latest edition of the nation’s leading listed companies. An equal number of corporations were not in contention at the inception of the rankings including the likes of LOLC, Dialog Axiata, Lanka IOC (LIOC) and Sri Lanka Telecom (SLT), all of whom feature on the 2016/17 Leaderboard. Aggregate turnover of the 50 leading listed entities has grown by 14 percent in the latest rankings whereas their combined bottom lines contracted by 24 percent – although this includes a massive restructuring loss of Rs. 70 billion absorbed by Distilleries Company of Sri Lanka (DCSL). To put things in perspective, back in 1993/94, cumulative revenue rose by 20 percent year on year while profits spiked by as much as 60 percent. 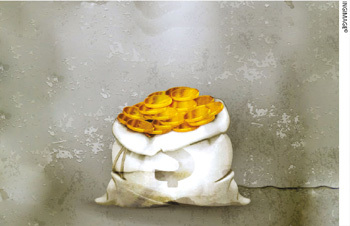 The aggregate asset value of the 50 leaders meanwhile, appreciated by a notable 17 percent during 2016/17 although their combined shareholders’ funds were only six percent higher from when the financial year began. As things stand, both corporate fortunes and biz confidence depend not only on the implications of the 2018 budget proposals outlined on 9 November but their implementation as well. In the meantime, businesspeople are taking a step back to assess their potential impact on corporate activity in the medium term. It remains to be seen therefore, whether the nation’s leading business houses will gear up to maintain the momentum that financial year 2016/17 by and large generated.